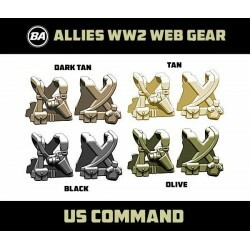 WW2 Web Gear Il y a 11 produits. 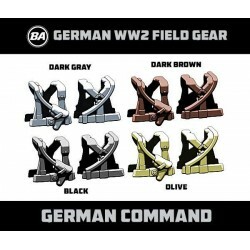 Designed for the hauptmann fig, the BrickArms German Command Field Gear is the perfect choice for any leader on the front lines of combat! 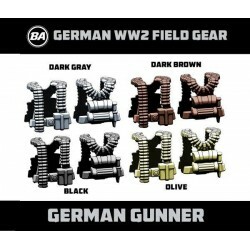 German maschinengewehrschutze figs always have an ammo belt ready for action when they're equipped with the BrickArms WW2 German Gunner Field Gear! 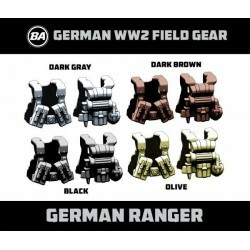 The BrickArms WW2 German Paratrooper (fallschirmjager) Field Gear includes a bandolier of FG42 ammo pouches for plenty of LMG firepower! Perfect for any landser fig, the BrickArms WW2 German Rifleman Field Gear includes pouches for Kar98 ammo and other key equipment to fight for the Fatherland! 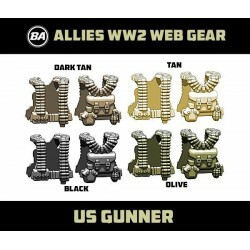 With an ammo belt at the ready, the BrickArms WW2 US Gunner Web Gear ensures your troops are prepared for belt-fed combat! Webgear for the battle-hardened veteran, the BrickArms WW2 US Ranger Web Gear includes a bandolier of M1A1 ammo pouches and grenades for extra firepower! 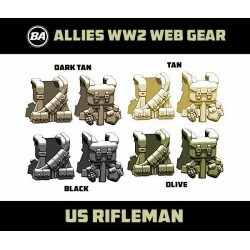 With a bandolier of Ammo pouches, figs with the BrickArms WW2 US Rifleman Web Gear are ready to provide all automatic fire their squad needs! 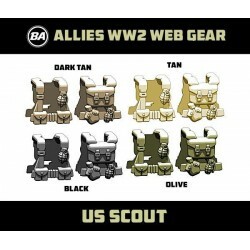 Standard, essential issue, the BrickArms US WW2 Scout Web Gear includes pouches for M1 ammo, a haversack, canteen, and Mk2 grenades.